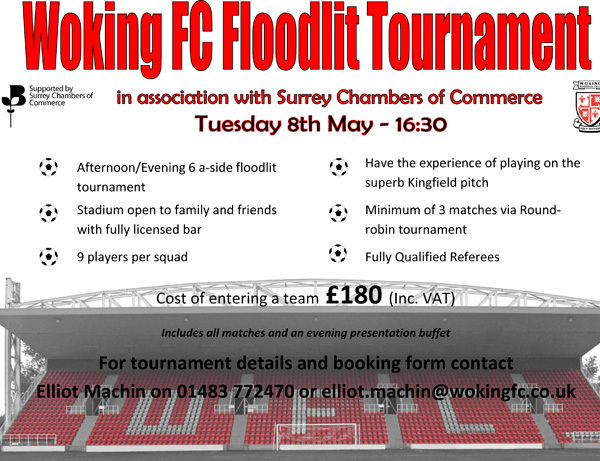 Woking Football Club are pleased to be hosting an end of season six aside floodlit football tournament, since the original announcement the price has changed and is now £180. The tournament will be run in association with Surrey Chambers of Commerce at the Kingfield Stadium on Tuesday 8th May 2012. The tournament is open to all, including local businesses, fans and football teams who would like to have the opportunity to play on the pitch at the Kingfield Stadium. The event will begin at 16.30pm and will finish at approximately 21.30pm with some of the final matches being played under the floodlights. The tournament will be run in a round robin format so all teams will have at least three matches with the two finalists playing six matches. Each team can be made up with a squad of nine players with a roll on roll off system for all matches. An evening presentation buffet will also be included for all players during the course of the evening, with trophies for the two finalists being presented. The cost of entering a team into the tournament will be £180 (inc.VAT) for a team of nine which equates to £20 per player.